A record-breaking 64.6 inches (164cm) of snow has been dumped on the US city of Boston during February. And the unprecedented weather has led to unprecedented acts of human endeavour, although one or two very much ill-advised. A craze dubbed "Boston blizzard challenge" emerged on social media with daredevil residents leaping from dizzying heights. Clips of half-naked people diving into "snow pools" were widely shared on social media. But the trend did not impress the city's Mayor Marty Walsh. "This isn't Loon Mountain, this is the city of Boston," he said. "I'm asking people to stop their nonsense right now. These are adults jumping out windows. "It's a foolish thing to do and you could kill yourself." After three tough mornings shovelling out his front yard in Jamaica Plain, when the fourth snowstorm hit Chris Haynes decided to try something a little more inventive. Taking a day off work, he hollowed out a cocktail lounge from the piles of snow - complete with colourful mood lighting - and invited friends and neighbours over to relax. The bar came as a total surprise to his wife Kristy Nardone. "I came home from work and voila! There was a snow bar," she told the Boston Globe. 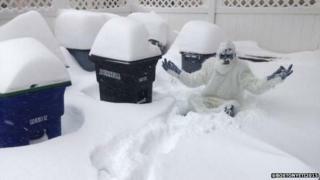 Perhaps the iconic figure of this historic winter, the mystery of the Boston Yeti has captivated social media users - with sightings widely shared. The Yeti has his own "official" Twitter account, with thousands of followers. And yet despite his massive following, his true identity is - at time of writing - still a mystery. When cyclist Ari Goldberger discovered his favourite route blocked by a giant snowbank, he and his friend Shadron Davis decided to take matters into their own hands. "The MBTA transport authority blocked access to the bike path when they ploughed the parking lot. We decided to do something about it!" he posted alongside this Youtube video. The 40-foot tunnel quickly became a tourist attraction for the city's cyclists... until authorities intervened and demolished the roof, most likely for safety reasons. This romantic residence for two was advertised on AirBnB by Cambridge resident Pier - yours for just $10 (£7) a night. "You can use the house bathroom and kitchen if you need," he kindly offered. "Tarp and yoga mattress provided. You'll need to bring your sleeping bag." However, the listing later disappeared, suggesting either (a) it was banned by AirBnB or (b) it melted. A pop-up winter sports Olympiad has sprung up on this giant mound of cleared snow at the campus of MIT (Massachusetts Institute of Technology). "They're calling it Mt. Cambridgemanjaro" said Reddit user ladallasbos, who posted pictures. Mt Simmons was another nickname doing the rounds on Twitter. "We'll ship your friends, family and enemies fresh snow from Boston," promises the website ShipSnowYo.com, with a tongue-in-cheek warning to customers that the cargo is "likely to melt" in transit. But the scheme, set up by 27-year-old Kyle Waring, an enterprising resident of Manchester-by-the-Sea, quickly snowballed into something much bigger. After word spread about his first sale - an empty water bottle filled with snow for about $20 - the orders began rolling in. He claims to have received about 150 orders so far, shipping as far away as California and Florida. He told ABC News he is now focusing on bulkier deliveries starting at $89, that are specially packaged to maintain a cold temperature. Friends and family think he's "extremely creative," Mr Waring told reporters. And indeed - the snow business has already inspired a follow-up for the Autumn - ShipFoliage.com. Shovelling out your car, day in day out, is a thankless task - and Boston residents police their parking spots with a fierce brand of justice. Woe betide the cheeky motorist who nips into a freshly cleared out patch of road. Some chose to dangle a carrot - offering friendly incentives such as these complimentary beers, below, spotted by Instagram user Waikikii. But other citizens were not feeling so altruistic. Harsh justice was meted out to this driver who dared to "steal" a neighbour's carefully-tended parking place. "This guy took my spot... so I put the snow back" said an anonymous Craigslist user who posted this revenge photo. "I had a marker, and I spent a long time clearing out this spot," the furious resident explained. "According to the Mayor, if you shovel out a spot it is yours for 48 hours after the snow stops. This guy didn't wait 24 hours so I put all the snow back." Is this an escape tunnel? Or a handy cave "extension" to your living room? Either way, you have to hand it to snowbound resident Trey Hemmingsen, who tweeted this picture with the caption "I #WishIWasInBermuda because I'm stuck in over 7 feet of snow in #Boston!" Well, this one guy did.